Ease back into skateboarding on a variety of skateboarding terrains, from flat land old skool sessions, to mini ramp, to pool skating to vert skating. Prizes awarded for best tricks in all disciplines, prizes from skateboard equipment, Vans shoes, Surfboard. Ceremonial dinner braai (bring your own) and ‘story telling’. Chilled morning ‘State of Skate’ discussion on where skateboarding currently stands and it’s future in SA. Free skating all over the facility and optional guided walks through Isithumba Village. Child Care Centre – The Indigo Youth Centre will entertain youths on site while the Ballies try and feel young again. Tents – most accommodation is booked already however there are still home stay possibilities in the neighborhood so please enquire with Dallas. If you are over 30 and still love hitting the streets on your skateboard, constantly in search for new banks & trannys or still get stoked on just bombing a hill. You have seen skate parks come and go, witnessed the scene almost disappear entirely and how it has come back to the masses. Skating means more to you than just a sport, it’s a lifestyle, it’s in your blood. This is what the essence of the SA Ballies Skate Camp is all about. It’s a gathering of this diverse community of creative souls, where for one weekend we can go back in time and have a care free skate session with some of SA’s finest old school skate legends. Bring your family along (kids included) to this picturesque setting in the KZN Valley of a 1000 hills, stay over, share stories and reminisce about the good old days to some good tunes and cheap beer. 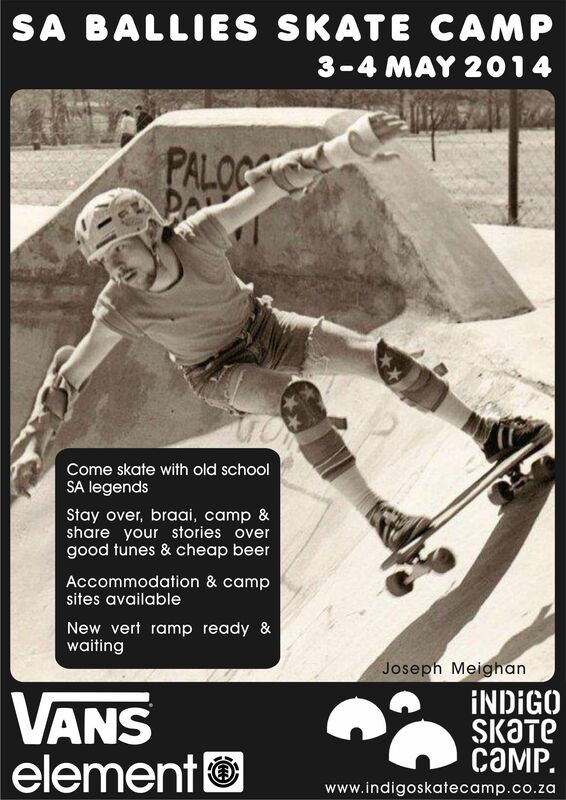 SA Ballies Skate Camp is hoping to become an annual event, to keep the scene alive and for old friends to stay connected.